Join the hooping craze or just get a really fun gift for a loved one! 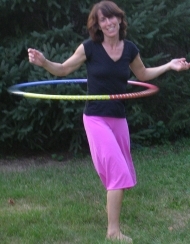 The adult hoops are weighted and sized to fit most. Custom made are also available. Children's Hoops, not the cheap hoops you find at the department store. These hoops are nearly indestructable, made of strong tubing, with a great hooping sound! Many sizes to be right fit. Custom made also available.